Thanks to Dr. Adela Cimic, Dr. Kim Geisinger and Dr. J. Sirintrapun, Wake Forest University (North Carolina, USA) for contributing this case. To contribute a Case of the Week, follow the guidelines on our Case of the Week page. � QA for PAs, Histotechs, Transcriptionists, etc. Our Buyer's Guide - Feature Page for June highlights Diagnostic testing / reagents, and includes Biocare Medical, Biotheranostics, Covance, Epitomics, Leica Microsystems, Olive Tree Media LLC and Ventana Medical. 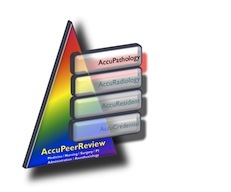 A 72 year old man had a transurethral resection of the prostate for obstructive symptoms. Microscopic sections show a background of inflammation with occasional atypical tubular glands with prominent nucleoli adjacent to smaller tubules lined by eosinophilic "hobnailing" cells. 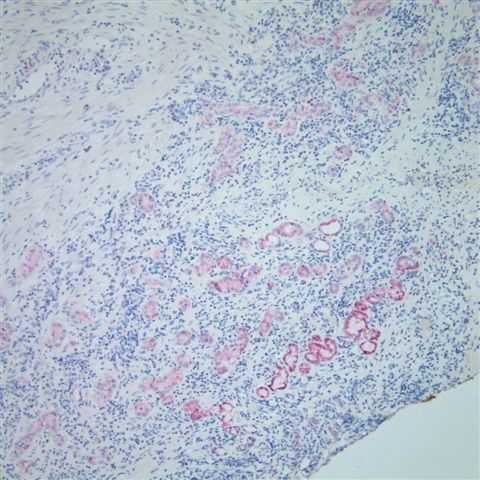 The PIN4 antibody cocktail (below) showed diffuse P504S (racemase) staining, but negative staining for CK903 and p63, mimicking prostatic adenocarcinoma. The tubules were also diffusely positive for CK7 (left) and negative for PSA (right). 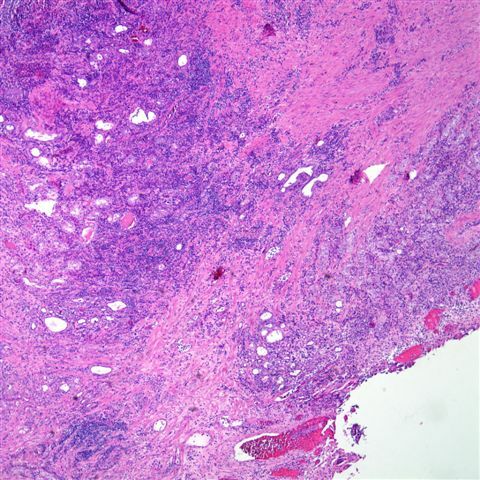 Nephrogenic adenoma is a metaplastic response of urothelium to injury, that rarely affects the prostatic urethra, as in this case. 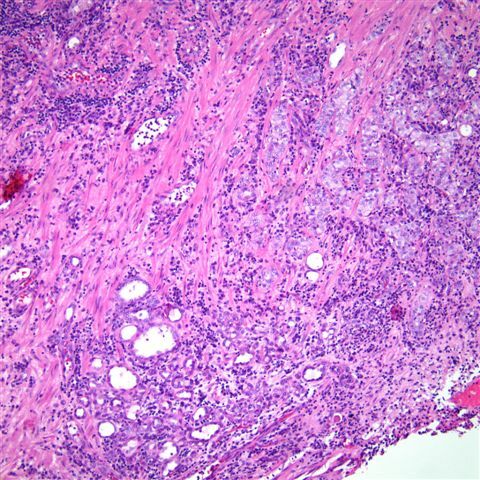 It is also associated with renal transplantation and intravesical bCG for bladder urothelial carcinoma. 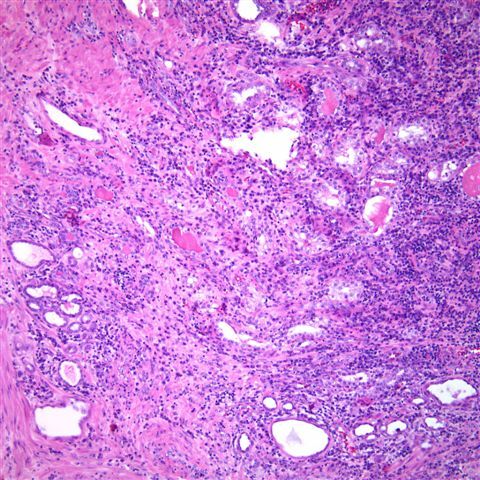 The small tubules of nephrogenic adenoma in the prostatic fibromuscular stroma may mimic prostatic adenocarcinoma in transurethral resection specimens and prostate biopsies. Histologic features of nephrogenic adenoma include tubules (96%), composed of a single layer of cuboidal or flattened cells with clear to eosinophilic cytoplasm, round nuclei and fine chromatin. Other features include inflammation (95%), extension into muscle (77%), structures resembling vessels (73%), the presence of adjacent urothelium (69%), peritubular sheaths (65%), prominent nucleoli (54%), cords and individual cells (46%), thyroidization of tubules (38%), blue-tinged mucinous secretions (32%), papillary configurations (19%) and signet ring cell-like tubules (12%). 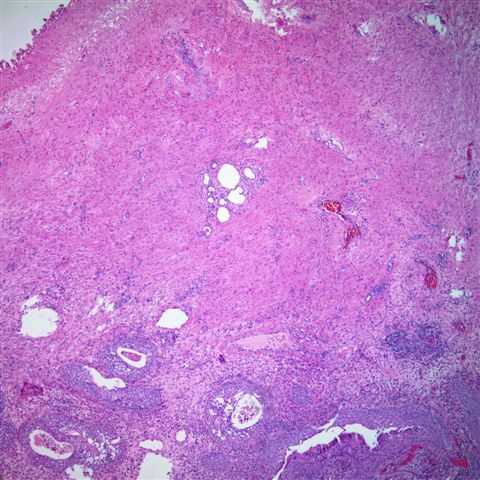 The adjacent urothelium, if present, often exhibits cuboidal metaplasia (61%) or squamous metaplasia (28%). Mitotic figures are not present. 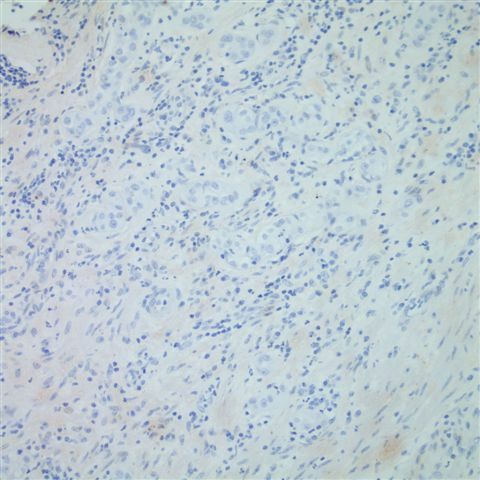 Nephrogenic adenoma has the same immunohistochemical profile as distal renal tubules, as both are positive for P504S and epithelial membrane antigen and negative for p63, CD10 and PSA (Arch Pathol Lab Med 2006;130:805). 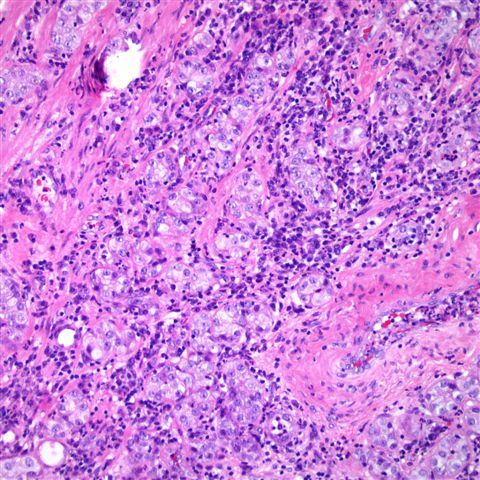 The differential diagnosis includes prostatic adenocarcinoma, which may share histologic features of tubules, cords, and signet ring-like tubules, prominent nucleoli, muscle involvement and blue-tinged mucinous secretions. 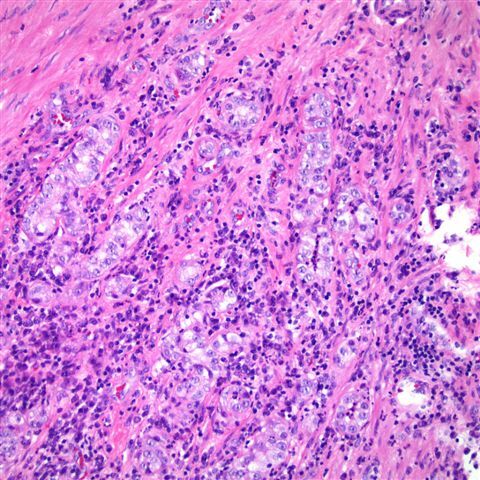 Nephrogenic adenoma, unlike other benign prostatic lesions, also shows strong and diffuse granular immunoreactivity for P504S (Am J Surg Pathol 2004;28:1224), a common, relatively specific marker for prostate cancer (Am J Surg Pathol 2001;25:1397). In addition, nephrogenic adenoma is frequently negative (44%) or only focally positive (44%) for CK903, and rarely shows focal PSA or PAP positivity, which also makes it harder to differentiate from prostatic adenocarcinoma (Am J Surg Pathol 2001;25:802). 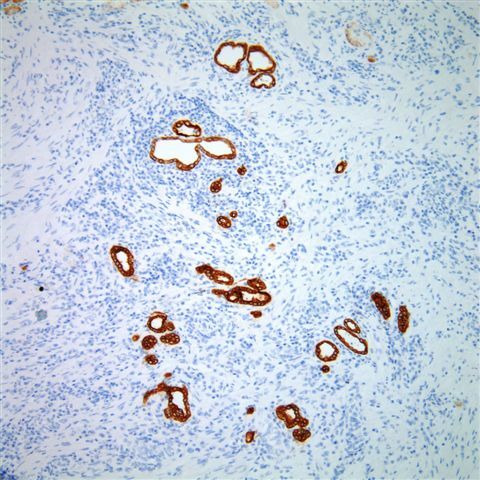 Useful features in nephrogenic adenoma to distinguish it from prostatic adenocarcinoma include the presence of adjacent urothelium, thyroidization, peritubular sheaths, inflammation and CK7 or CK903 immunoreactivity. Excision is usually curative for nephrogenic adenoma, as it is benign and does not typically recur.